We have a range of health and social care qualifications which are suitable for those who are just starting out on a career in health and social care to those who want to grow their skills and knowledge in their role as a health and social care professional. Support Worker at Intensive Community Treatment Service (ICTS). This is very much dependent on your job role, experience and aspirations. Please get in touch and our programme lead can advise on which qualification might be best for you. How are these qualifications delivered? 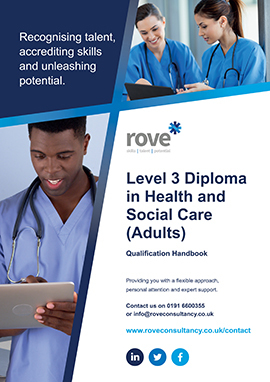 This is very much dependent on the specific qualification however, if you enrol on any of our Health and Social Care qualifications you will be allocated a Tutor (subject specialist) who will support and guide you during your qualification. In addition, you will be provided with an account for our web-based system which allows you to access learning and study support materials and much more.